We recently provided public relations support and writing services for a two-month run of Matsuri, which is also the number one production show in Japan. The show, which featured world-ranked professional athletes and Olympic medalists, combined athletics, extreme sports, dance, and Japanese tradition. While in Las Vegas, it scored a long list of positive local and national reviews. Not bad, considering we never had an opportunity to see the show prior to the public relations launch. Sometimes our job is like that. In a city like Las Vegas, the vision of what's to come is all you can hope to communicate. We've worked on countless communication projects for shows, events, companies, and others over the years, ranging from The Alexander Dawson School at Rainbow Mountain to New York - New York Hotel & Casino to Konami's entrance in the United States. 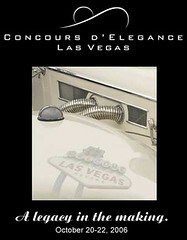 Next up is something I'm really looking forward to: The inaugural Concours d'Elegance Las Vegas. Concours d’Elegance Las Vegas, an upscale auto show for legacy and select classic automobiles, will be held in Las Vegas, Oct. 20-22. It's already creating a preliminary buzz in the auto world after recently securing George Barris as honorary chairman. Barris, if you don't know, is the best-known designer of custom cars in the world. Beyond the Barris connection, we've been thrilled to work with Concours development veteran Elaine Sherer and retired Saatchi & Saatchi designer Don Lais. Both are great to work with -- Elaine because she immediately saw the value of implementing our core message strategy and Don because he has an uncanny ability to grasp a visual concept and bring it to reality. The end result is an event that is already shaping up to be a huge success with more than 100 mint condition legacy automobiles featured, along with a special venue for classic cars, an automotive art show, live music, and gourmet food vendors. Ultimately, Las Vegas will become the most visiable and successful Concours location in the world with more accommodations, world class dining, fashion, golf, and entertainment than any previous Concours venue. If you'd like to see the communication and news of this event unfold, visit www.lasvegasconcours.com . Right now there is a place holder for the Website, but we're expecting Don to resolve a nav bar issue soon so the rest of the site and event information will follow. In short, if you love automobiles, we'll be seeing you in Las Vegas this October. Quick update: While the event continues to show promise, we've removed ourselves as communication consultants to focus on long-standing accounts and the race for governor. We've given Elaine the best possible communication foundation and wish her the best of luck in whatever she decides to pursue, whether it continues to be Concours or something else entirely different.